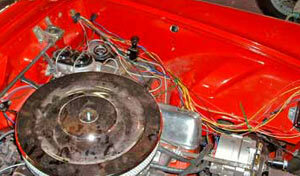 In our last T-Bird project update we left off at the completion of the wiring of the dashboard. 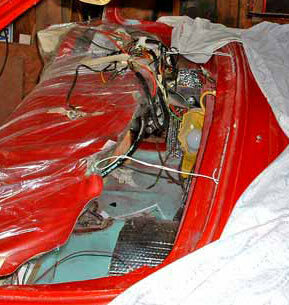 With the dash temporarily mounted a few inches behind the firewall to allow access, we started on our main harness. In case we hadn't mentioned it, we had made all connections to the dash components and left about 2 feet of wire on each to run through the firewall opening and into the engine compartment. These were marked and color-coded for connections later. The dash is sitting in its temporary position. We should also mention that we threw away the normal practice of using inline connectors like the factory provided. All manufacturers used such connectors because they made it very easy to replace items like parking lamp and headlight harnesses after collisions, but over time the connectors cause corrosion at the contact points. 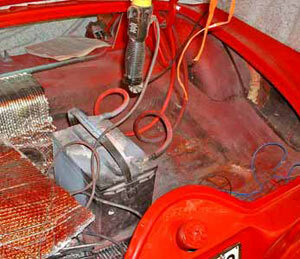 Eventually the corrosion causes high resistance, which in turn causes dim bulbs, malfunctioning horns, etc. The engineers who designed the cars never thought they would be on the road decades later, or otherwise would have used weather-tight connectors. We don't think the old OEM connectors represent good long-term engineering, so we soldered and shrink-insulated every connection possible throughout the car. It's more time-consuming and certainly not original, but the lights and horns and other electrical devices on cars we restored 30 years ago are still working perfectly. We believe it's well worth the extra effort required (cutting and re-soldering connections) when it's necessary to replace or remove an electrical component later on. 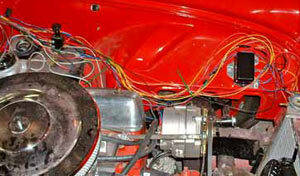 There is nothing tricky or difficult about what we did in creating the main wiring harness. There was no particular thing we started with either, except the decision to "string" the longest leads first and then work back to the firewall behind the engine. So, we started with the headlights and parking lights. We didn't need the lights themselves initially, since we simply needed to run the appropriate number of wires to each assembly - leaving enough extra material for connections. That meant two heavy wires (12-gauge, to carry 10-20 amps) to the headlights (low and high beam) and two thinner ones (16-gauge) to the parking lights (running and turn signal), plus a common ground for all. We wanted to run a common ground instead of relying on the original grounding system, which was simply the screws holding the fixtures to the body structure. Over time the screws would corrode, causing dim lights. We connected the appropriate wires to their mating "pigtails" coming from the dash. The wires all ran on the driver's side of the wheel well and into the car behind the dash, where all connections were made at the time. In most cases these connections were "eye" connectors that we soldered onto the ends of the wires. We incorporated inline fuse connectors in most circuits also. This was done to eliminate the lack of a fuse panel in the original cars and to make the fuses easily accessible. So how are we keeping track of the wires? Well, our new wire only comes in a few colors, but we have a color-taping kit especially made for wiring. For each wire we choose the appropriate two-color code and tape both ends. Next, we note the codes onto our master schematic, so it's easy to trace where any given wire goes. This handy color tape dispense is made by 3M. It's invaluable! Next, we ran wires for the horns. Since this would incorporate a relay, we ran 16-gauge wire from the power source to the relay and a ground wire back to the horn button. From the relay we ran 10-gauge wire to the two horns, along with ground wires that connect to the one leading to the horn button. High current to the horn relay was provided from the alternator connection, through a point on the voltage regulator. 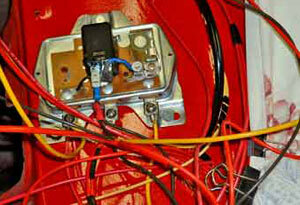 We actually aren't using the original voltage regulator, so we "gutted" it and are using it for our main buss bar. One connection is for power distribution, one for ground and the last for our horn relay, which is cleverly buried inside the regulator box. The horn relay is hidden in the old voltage regulator. Working back from the front of the car, we ran new wire to the oil pressure sending unit and soldered it to the lead attached to the dash's indicator light. The same was done to the connections at the coil (three leads, including the tachometer pickup), starter, A/C compressor, heater blower, alternator (two leads: one to the field and one to output) and water temperature sending unit. We also ran leads to our newly installed power antenna assembly. It looks like a confusing mess of wires, but the color-coded ends and notations on our schematic make it easy to trace. Additional power was taken from the voltage regulator "buss" and run to a thermostatic relay that we installed for a cooling fan. 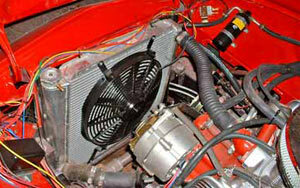 This was necessary because there is no clearance for a water pump-driven fan due to the steering rack placement. We tested all circuits to make sure everything worked and that there would be no "surprises" later on, after we installed the dash. Notice the run of wires, including those to the cooling fan relay, upper right next to the A/C dryer canister. Now that we had the front taken care of, we turned our attention to the rear end. We ran the appropriate gauge wires along the floor next to the transmission tunnel, just where Ford had run them 50 years ago. We had to run three wires to the brake/turn signal lamps (as with the front, we ran a ground wire to the rear) and two to the backup lights. Two more were run to the gas tank sending unit and license plate light. We took our time running these wires in order to protect them from getting damaged by whatever might eventually be put into the trunk. You might remember that we mentioned in a previous article that, due to placement of a dual-stage master cylinder, brake proportioning valve and transmission pressure gauge, there was no room for the battery in its original location next to the engine. The decision was made early on to place the battery in the right wheel well in the trunk. This, of course, meant we'd have to run some seriously-big wires. Here's where the battery now lives. We had big battery leads made up at the local battery shop, A&R Battery. For less than $20 they provided two 16-foot leads, one in red and the other in black, complete with battery and eyelet terminals (three, in the case of the red lead). We located the battery at the rear and ran the wires over the wheel well through the floor of the car and along the frame rail, all the way to the starter and engine block (red and black wires, respectively). At about every two feet we made hold-down brackets to keep the cables from chafing. The red lead had been made up in two pieces, with the mating ends configured as eyelets. Just before it met the rear floor area of the car we connected these two ends to a heavy-duty battery cutoff switch, which is something we do with every restoration project. It adds a measure of safety and security and the batteries maintain their charge for months without recharging. What About All Those Wires? Okay, it's not neat at the moment.